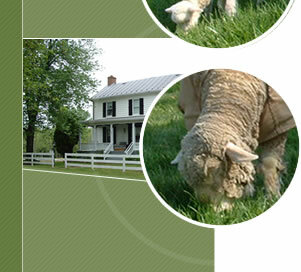 Cormo wool is a fine white wool in the low 20 to 23 micron diameters. It creates a next-to-the-skin garment. 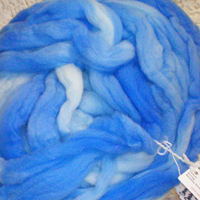 It is excellent for spinning, blending, and dyeing. Wooly Booly fleeces have been covered and are well-skirted. 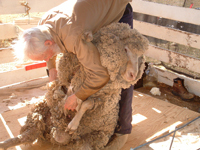 We have been having our sheep sheared by Kevin Ford. He is a blade shearer, not electric. 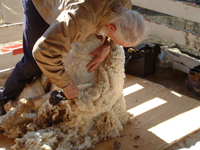 He lives in Massachusetts and travels down to North Carolina and back shearing sheep. He writes the column "Shearing Notes" in sheep! magazine, where he answers questions about wool in every issue. Click here newspaper article on Kevin Ford. Sheep are shorn in February. 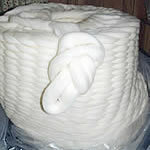 Call then for fleece availability. 2013 fLEECES are sold out. Our combed top is absolutely beautiful. 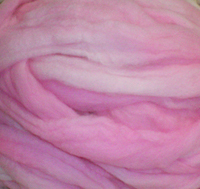 It is processed to take all the vegetable matter out and the strand is ready to dye or spin. Cormo spun by Zeilingers into a 2-ply light worsted yarn. Ready to dye or knit. Sample upon request if needed. I prefer to use your check as payment. I know it slows things down, but security issues have increased and made us all vulnerable. Each shipment will be figured out exactly, and you will be notified by e-mail or phone. I do use PayPal as well but it annoys me to pay them for the privilege. Payment received and the wool gets mailed. Everything is money-back guaranteed, minus the shipping.